Background Under physiological conditions, the melanocortin system is a crucial part of the complex network regulating food intake and energy expenditure. In pathological states, like cachexia, these two parameters are deregulated, i.e., food intake is decreased and energy expenditure is increased—a vicious combination leading to catabolism. Agouti-related protein (AgRP), the endogenous antagonist at the melanocortin-4 receptor (MC-4R), was found to increase food intake and to reduce energy expenditure. This qualifies MC-4R blockade as an attractive mode of action for the treatment of cachexia. 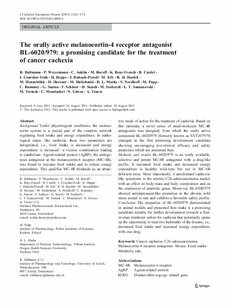 Based on this rationale, a novel series of small-molecule MC-4R antagonists was designed, from which the orally active compound BL-6020/979 (formerly known as SNT207979) emerged as the first promising development candidate showing encouraging pre-clinical efficacy and safety properties which are presented here. Methods and results BL-6020/979 is an orally available, selective and potent MC-4R antagonist with a drug-like profile. It increased food intake and decreased energy expenditure in healthy wild-type but not in MC-4R deficient mice. More importantly, it ameliorated cachexialike symptoms in the murine C26 adenocarcinoma model; with an effect on body mass and body composition and on the expression of catabolic genes. Moreover, BL-6020/979 showed antidepressant-like properties in the chronic mild stress model in rats and exhibits a favorable safety profile. Conclusion The properties of BL-6020/979 demonstrated in animal models and presented here make it a promising candidate suitable for further development towards a firstin- class treatment option for cachexia that potentially opens up the opportunity to treat two hallmarks of the disease, i.e., decreased food intake and increased energy expenditure, with one drug.